at Feed My Starving Children. A year ago in January of 2017, I became the Vice President of Service for one of the service clubs at Northwestern. 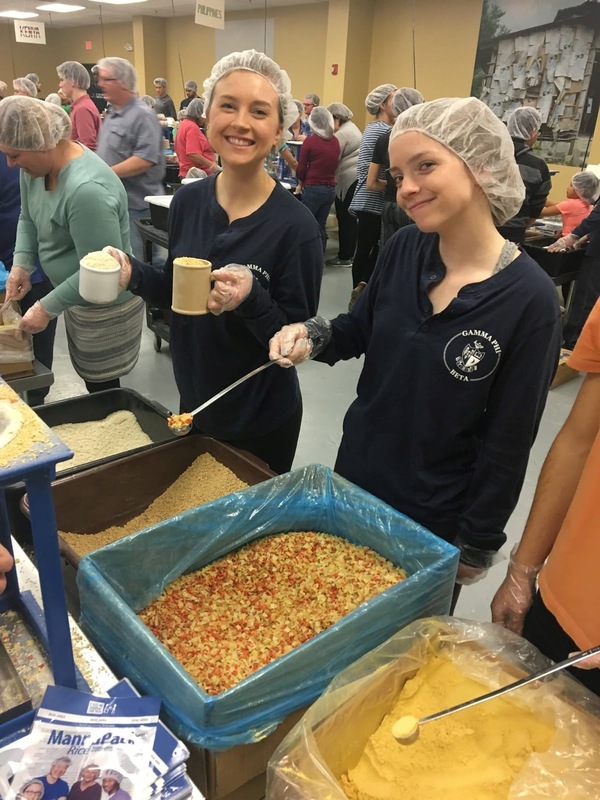 In charge of organizing all volunteering events, I planned trips to pack food for Feed My Starving Children, visit residents at a Winnetka retirement community, and tutor 3rd grade students at a local elementary school, and of course my favorite trip was to the Jesse Brown V.A. Memorial Hospital to play bocce ball with veterans! before a town hall meeting. It was exciting to take other Northwestern students where I had gone two years before during the MVS Leadership Weekend in Chicago. My time as the VP of Service came to a close at the end of spring quarter. It was a lot of work, but I’m so proud of all that the service committee was able to accomplish. 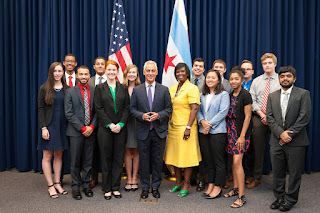 When school ended in June, I started a summer internship working in Senator Richard Durbin’s Chicago office. I was in the scheduling department so in addition to answering phones and sending out letters, I helped organize the Senator’s daily agenda. Every day was something new, and the intern coordinator worked hard to make sure we learned as much as possible. There were guest speakers every other week and we spent many days taking field trips to other government offices in the city. 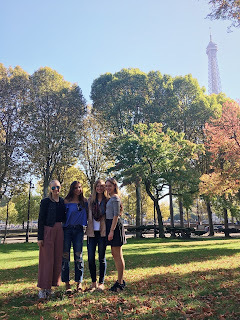 My internship ended on August 24, and I left to study abroad in Paris on August 25. In class, I was learning about the political and economic agenda of the European Union and how to speak French. As a part of the program, we visited the European Parliament in Strasbourg and the European Council and Commission in Brussels. I also traveled outside of the program a few times to Barcelona, Vienna, and London. It was a great four months of traveling, speaking French, eating cheese, and making new friends. P.S. 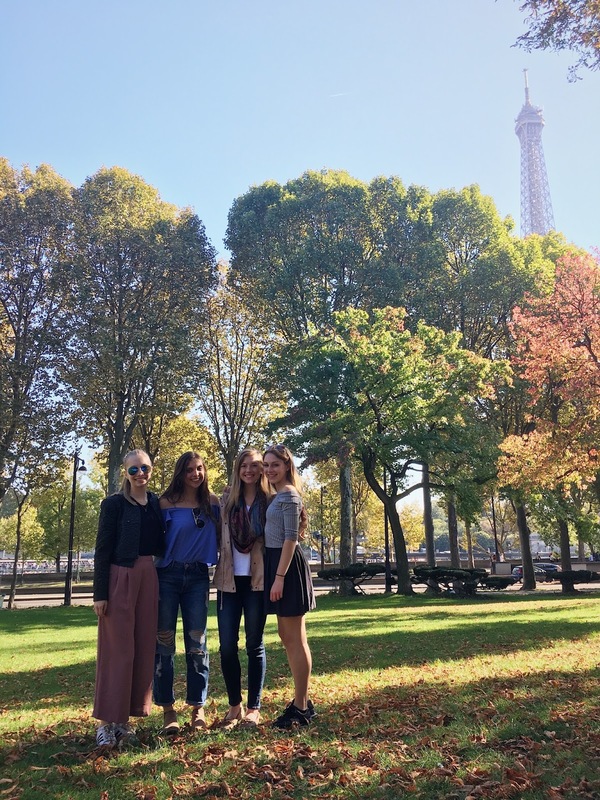 For any other Elks Scholar interested in studying abroad: in addition to the ENF, I was also able to go abroad with the help of the Gilman Scholarship Program. It is a nationwide program run by the Institute of International Education to help students study abroad who typically wouldn’t be able to for financial reasons. It was the only way I was able to go to Paris, and I would highly encourage my other #ElksFamily members to apply. Here’s the link to their website, and if you have questions please don’t hesitate to reach out to me. I landed back in Chicago on December 9 and I am looking forward to the year ahead, which I’m sure will pass just as quickly. I’ll be living in an apartment off campus with a few friends, studying for the LSAT, and getting ready for the 150 for 150 Service and Celebration Weekend in San Antonio with my fellow scholars!